If there was any hope of Oregon sneaking into the NCAA tournament at the last minute, a weekend sweep over a beleaguered Utah team was a must. The Ducks rose up to the challenge with three straight wins over the Utes. Now they have to keep on winning and not look back. Oregon (25-24, 11-13) has six games left, two weekend series with UCLA and Arizona. To even be on the bubble, the Ducks have to win out and then let the chips fall where they may. But to even sniff the bubble, Oregon had to take care of business at home over Utah and this past weekend got off to a good start with a 6-2 win over the Utes. Oregon followed up that solid win with a Saturday afternoon 13-1 rout. In the series finale, Kyle Kasser crossed the plate four times himself, including racing home on a wild pitch in the bottom of the ninth to squeeze out a 4-3 win. The weekend sweep dropped Utah to 6-18 in conference play and to just 13-35 overall as their nightmare season continues. Kenyon Yovan was the star Friday night with the win on the mound and belting a two-run homer in the fourth to put his team on the board en route to the four-run win. Yovan improved to 5-3 as he went seven innings, giving up two runs on six hits, whiffing two, but walking six. The walks generally didn’t hurt Yovan as the Utes left 11 runners on base. After Yovan homered in the fourth, Oregon filled the bases before Jakob Goldfarb walked to bring home Ray Soderman to make it 3-1. Oregon scored one run in the sixth to make it 4-1 and then Johnny DeLuca belted a two-run homer in the eighth to add some insurance and the 6-2 lead and eventual win. It was all Oregon less than 24 hours later. Matt Mercer (5-5) dominated on the mound and kept the game close until the Duck bats found there mark late. It was 2-1 Oregon through six innings and then the home team exploded for five in the seventh and six more in the eighth for the easy win. Mercer went seven innings, giving up just one run and five hits while striking out 10 Utes. Yovan’s sac fly in the first gave Oregon an early 1-0 lead and Soderman’s double down the left field line in the sixth made it 2-1 Ducks. Utah’s Josh Tedeschi was pitching well through six innings, but ran out of gas in the seventh as Oregon tagged the starting pitcher, giving him his ninth loss on the season. Gabe Matthews’ two-run triple blew the game open to make it 6-1 Oregon. He also added an RBI double in the eighth for a three RBI day and was just a homerun short of the cycle. Sunday game was a bit more exciting. Oregon found itself down 2-0 after three innings, but the Ducks scored one in the fourth and one in the fifth on a throwing error to tie the game 2-2. Utah took a 3-2 lead in the sixth, but Oregon answered in the seventh when Spencer Steer’s sac fly brought home Kasser for his third time scoring and tying the game 3-3. It was still a tied game in the bottom of the ninth when Oregon had the bases loaded and two outs. Utah was that close from sending the game into extra innings, but Trenton Stoltz’s pitch went to the backstop and Kasser raced home from third to end the game. 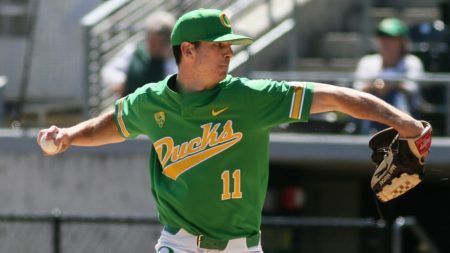 The post Ducks Earn First Pac-12 Series Sweep Over Utah appeared first on DuckNews.com.